If you are visiting us from Tip Junkie (or anywhere else for that matter), WELCOME!!! I custom make traditional items like a-line dresses, john-johns, blankets, bibs, burp cloths and loveys with trendy, traditional and retro fabrics. I can also personalize each item with a name or monogram, which is perfect for baby shower gifts and first birthdays too. Check out my recent additions here on my blog and then head over to my Jackaroos Boutique store to see the entire collection. 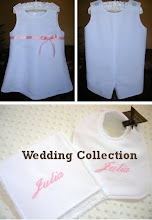 Our Wedding Collection is 15% off during the month of July. White Waffle Weave Pique Bib and Burp Cloth Set from our NEW Wedding Collection. Also great for Christenings/Baptisms and Special Occassions. 15% off this set during the month of July because it's part of our Wedding Collection that is on special. Cute, cute, cute stuff! Love the fabrics that you use too. I've linked you to my blog! Thanks so much Blaisdell Family! How adorable is all of this cuteness! I was acutally reading another blog that mentioned your site and well I had to come take a look. I have a lot of babies of friends/family coming up so I am always in need of something cute for baby. I added a post to my blog as well! Just for a fun link share. I just love baby items! They are always so cute! Hi Rhonda. Thanks so much for the kind words and the post on your blog! Adorable!! I love the fabrics that you use. Everything is so cute in your store. I am definitely going to add your link to both of my blogs! Add it to your blog, email us & receive 10% off code!